My Dad's family came from England in the 1880's. ........Note: I may have Louise and Mary Jane reversed, I never met them and have never seen a photo where they were identified. The rest are accurate. My great grandfather, Enoch was married to a lady named Elizabeth (Bryon) She was from Ireland. The name was probably originally O'Brien. 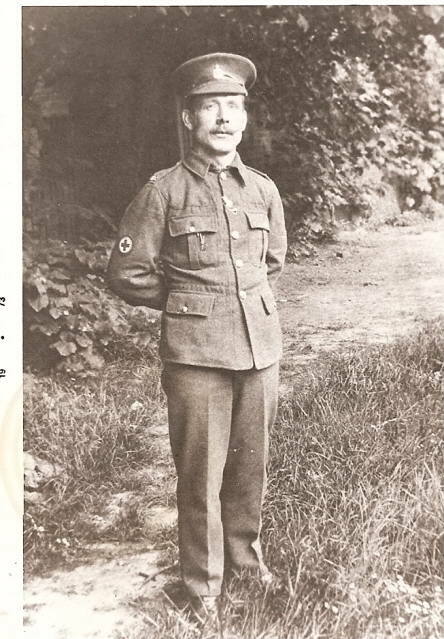 My grandfather, also named Enoch, married a lady also named Elizabeth (Symes) She was of direct Scot descent. They settled in eastern Ohio where the coal mining industry was robust at the turn of the century (1900). The photo to the right is of my grandfather Enoch, Grandmother Elizabeth (Symes) Great Aunt Sophia (Wootton) Armstrong and Great Uncle Joe. They were all born in England except grandma Elizabeth, she was a first generation American, as her mother and father were from Scotland. My Great Uncle Charles (Charlie) returned to England about the turn of the century. He decided he could not live with the woman he had married and went 'home'. I do not know the particulars of that story, but he did get remarried in England and had a family there. His family still lives in the town of Ashington. He also had two grandsons who moved to New Zealand. One of his great grandchildren recently moved to Australia. Note: His American wife's tombstone is located in Bethlehem Cemetary, off in a corner by itself. She is identified as Nellie (Wootton) Swick. My grandparents, Enoch and Elizabeth (II) had 3 boys and a daughter. All are deceased, Aunt Doris recently passed away (May 2012) at the age of 91. I was privileged to conduct her funeral services. Dad was known as 'Jimmie' to all his friends (and to Mom), however, he did not have a middle name, though many people have thought that it was James. "Jimmie", however, was only a nickname. Dad left home at age 16 and traveled the country for several years until he met mom. This was from 1926 though 1931. At times he was essentially a hobo. During that time he attended the Colorado School of Mines, worked as a lumberjack in northern California, visited Mexico and traveled through Texas. His advice to me about Texas was, "John, watch out for those 'Sabine Women" He never specifically identified what I was to look out for, but I have met a few of them, and they are definately worth looking out for. He was a coal miner, and later became an ordained minister with the Church of God of Prophecy. He attended their seminary in Cleveland, Tennessee. During his career as a minister, he founded 7 churches, several of which are still viable today. At the time of his death at age 82, he was still active in the ministry work, preaching as a visiting minister, performing weddings and funerals and was the ministerial counselor for the Cambridge, Ohio 'Women's Aglow'. Mom was the founder of the Cambridge Chapter of the Women's Aglow, and a few years before her death, she was the president of the Southeastern Ohio Region. 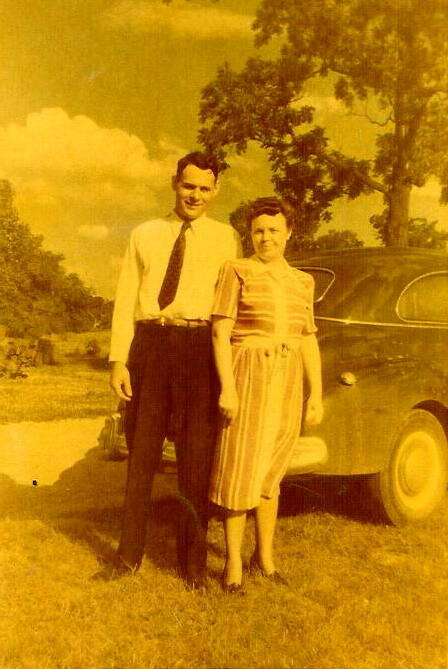 My mother, Ruby Lee (nee; Snodgrass), was born and raised in Arkansas. Her maternal grandfather; Loranzo Parks, was a union soldier (Kentucky) during the Civil War. Her mother, Minnie, was married 2 times, but was unfortunate in that both husbands died. She finally gave up. She had no special skills or training and raised her family by cleaning homes, taking in ironing and picking cotton. She was an devout Christian, and refused to let my dad date my mom until he became a Christian also. She was part Cherokee Indian, however, we do not have a paper trail to connect us to the "Rolls". The best we can ascertain, is that her mother was Cherokee, her last name was Manus, and we were able to identify her father, who was identified as 'Manus" on the Cherokee Rolls. However the paperwork of his marriage and my grandmother's birth have disappeared. She recalls that they had a LaSalle automobile, of which he was quite proud. The LaSalle was made by the Cadillac Motor Car Company! Horse trading must have been a prosperous trade. She also recalls that they used to go to Memphis on week-end shopping trips where they stayed at the famous Peabody Hotel. It is famous for the ducks that live on the roof, and are brought to the lobby every day to swim in the lobby fountain. However this tradition started in 1933 (see url website 'Peadbody Hotel' above) and had not begun when she stayed there. Note: I had the opportunity to visit the Peabody Hotel last Christmas (2016) with my sister Carolyn. We were honored to recieve a personal official tour of the hotel, and have it's history shared by the "Duck Master" after having watched the parade of the ducks from the roof to the lobby fountain, where they spend their days. We were slightly dismayed to discover that the present hotel was not the one my mother visited as a child, as the present building was built later to replace the much smaller original. 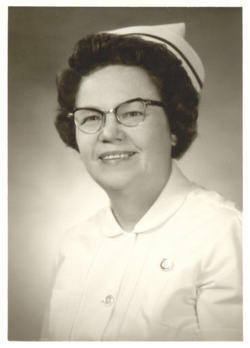 Mom was an Registered Nurse and was the 'pusher' in the family for us to 'better' ourselves. She had a strict rule for all of us, and that was to "never hang our dirty laundry in public". She was also an ardent Christian and a real 'prayer warrior' for God. When she married my dad she became a 'WOOTTON' totally, and solidly backed our Wootton family heritage. (Ruth 1-16) Also see "A Virtuous Woman" page on this site. 1) James Robert [Bob] who was a Chiropractor. He passed away in 2015 at the age of 80. He resided in Ft Myers, FL until his death. 2) Jean, who passed away in 2001, she was a physician, an attorney and a university professor and department head. (Old Miss), She didn't quite make it to "Indian Chief". Very few people will "get", or appreciate that! 3) Charles William, who lives in Columbus, OH, he recently retired after having operated a small cab (taxi) company for many years. 5) James Bryon, who also lives in Columbus, OH and is a very successful Realtor specializing in church properties. He is still active at the present (2018) age of 73. 6) my sister Carolyn, who lives near Dallas, TX , she is also a Registered Nurse and retired several years ago. There were two other girls, who died within a day or two of birth. Naomi Ruth, and Wanda Lee. Naomi was the first child born to my parents and Wanda was born a couple of years before me. They are both buried in the family plot, but do not have markers for their graves. My mother passed away in 1991 and Dad went to be with her in 1992. Most of our deceased family members (18) are buried in Bethlehem Cemetery in Robbins, Ohio. It is interesting to see the monuments of my grand parents and great grand parents, which are identical except for the dates. Their stones are located very close together. My Uncle Bill and Aunt Doris are buried near Washington, PA, though in separate cemeteries. 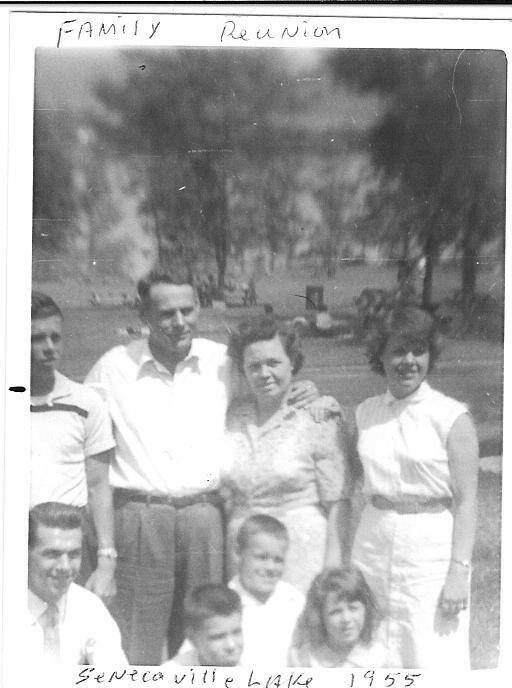 The photo posted to the right is of my family, taken about 1954 at Senecaville Lake (Senecaville, Ohio) at the Wootton Family Reunion. It is the only photo that I am aware of, of the entire family together. I am kneeling at the bottom center of the photo. Bob, [front row] and Charles [to Dad's right] were unfortunately ,partially cut off. Jean is standing to my Mom's left, Jim is directly in front of Mom and Carolyn is in the front row to Jim's left.. 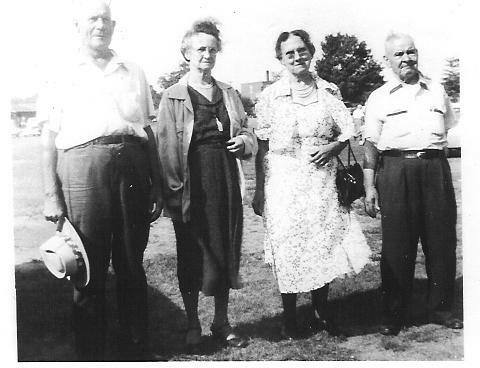 The Wootton family still has Family Reunions, presently held at The Plumb Creek Park in Brunswick, Ohio. Located in Medina County just south of Cleveland. Presently sponsored by Mary (Wootton) Andreano. Until a couple of years prior to her death, my mother was the reunion organizer for many, many years. A difficult job that she cherished.